The following article will demonstrate how to style different parts of the RadRadialMenu control. You can find more information about the visual parts of the RadRadialMenu control in the Visual Structure article. To style the content menu you can use the ContentMenuBackgroundStyle property of the RadRadialMenu. You have to set a Style that targets the Rectangle type. When the ContentSectorBackground property of the RadialMenuItem is set, the menu item will overlay the background of the content menu. To style the NavigationMenu you can use the NavigationMenuBackgroundStyle property of the RadRadialMenu. You have to set a Style that targets the Rectangle type. When the menu items have child elements, the NavigationItemButton will overlay the background of the navigation menu. To change the appearance of the NavigationItemButton, you have to define an implicit style in the Resources of the RadRadialMenu that targets the NavigationItemButton type defined in the Telerik.UI.Xaml.Controls.Primitives.Menu namespace. The RadialMenuItem can be styled via its ContentSectorBackground property. You can use the InnerRadiusFactor and the InnerNavigationRadiusFactor properties to control the size of the RadialMenuItem. To change the appearance of the DecorationItemButton, you have to define an implicit style in the Resources of the RadRadialMenu that targets the DecorationItemButton type defined in the Telerik.UI.Xaml.Controls.Primitives.Menu namespace. 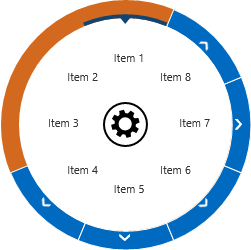 To change the appearance of the RadialMenuButton, you have to define an implicit style in the Resources of the RadRadialMenu that targets the RadialMenuButton type defined in the Telerik.UI.Xaml.Controls.Primitives.Menu namespace.